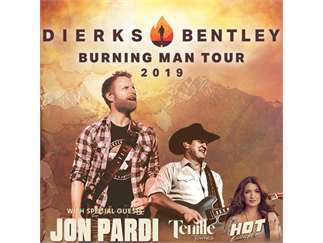 Current three-time CMA nominee Dierks Bentley announced his 2019 Burning Man Tour set to kick off on January 17th with a stop at Van Andel Arena on Saturday, March 30, 2019 at 7:00PM. The Burning Man Tour includes special guests Jon Pardi, Tenille Townes and Hot Country Knights. Bentley is known to "pull out all the stops, not quitting until the crowd is whipped into a frothy frenzy" and will continue to do so in 2019 with the run named after his "most affecting song" and hit single "Burning Man" feat. Brothers Osborne. "I talked to Jon Pardi last April about the idea of going back on the road together one last time, and I am so happy that I can finally let our fans in on this," said Bentley. "I'm still coming off the high of playing Hollywood Bowl and the last tour, but knowing that this Burning Man Tour with Pardi was out there waiting has been so awesome. We cannot wait to get back on the road."